A number of residents in the ward have complained to me about dog fouling. I report instances of this when I see them or they are reported to me. It is good to see that the Council have responded by increasing the number of warning notices in the Dales area of the ward. I hope these are followed up with increased enforcement against offenders. Environmental Health: 0151 233 3055. This is for reporting noise or excessive rubbish on private property. Note that the night noise team only operates from Thursday to Sunday nights. Liverpool Direct Limited: 0151 233 3001. This is for reporting any bin issues (missed bin collections, stolen and damaged bins etc. ), highway issues such as damaged roads or pavements, litter and flytipping. Police: For non-urgent enquiries and reports: ring 101. The 999 number is for emergency calls only. Our local police team is the Riverside, St Michaels & Greenbank Neighbourhood Policing Team. Universities: Liverpool: 0151 794 2000. John Moores: 0151 231 2121 or 0151 231 2083 outside normal office hours. Hope: 0151 291 3000. Student community representatives have not got a dedicated telephone number at present but if you have access to email, you can email them at community@ljmu.ac.uk – this is the contact for all university student representatives across the three universities. 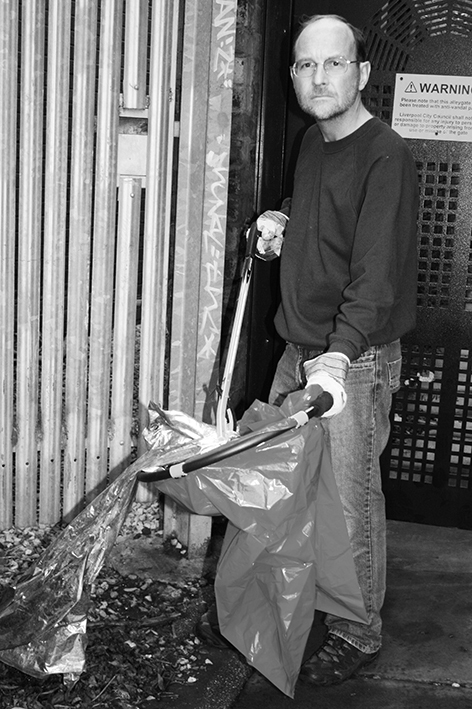 Lawrence gets to grips with the litter issue in the Dales area. Whilst the street cleansing staff who work in our area do a pretty good job in difficult circumstances, nevertheless there are one or two localised places where litter does accumulate. Rather than wait for a special cleanse of one particular ‘grot spot’ which hasn’t been cleaned properly for a long while, Lawrence Brown joined some Green Party members for a quick clean up. If you know of places which seem to be missed off the cleaning schedules, let Lawrence know – see ‘contact’ page for details. Lawrence is pleased to say that the new contractor for City Council streetworks, Amey, has been getting works done following his reports to Liverpool Direct. Streetlights in Lidderdale and Borrowdale Roads have been repaired, flytipping has been removed from several alleyways in the Dales area and dog fouling has been cleaned away from a number of locations. Works are still outstanding to replace faded road markings and make repairs to roads and pavements. Lawrence is hopeful that, following inspection, these will be carried out in due course. If you want him to report any issues on your behalf (and chase them up if they don’t get done), let him know – see contact page. Lawrence Brown attended the recent consultation meeting for the new St Hilda’s School on Ullet Road. The building will be situated on a combination of the current site and the ex-City Council building, Sefton Grange next door. Whilst the plans have much to commend them, certainly in terms of environmental sensitivity and content – solar power generation, passive solar design, large and secure cycle storage facility etc. – Lawrence is aware that some residents who live close to the site have concerns about the size of the development. He would like to hear your thoughts about the scheme; please drop him a line or give him a ring if you have a view about it.